"Ellesmere delivers an exciting album that will attract many listenings... for the pleasure, quite simply." Ellesmere is a large island in Nunavut, located far north of the Canadian Arctic Archipelago. It is also the name chosen for his musical project by the Italian multi-instrumentalist Roberto Vitelli, author of a first album dedicated to the "Chateaux de la Loire" (in French in the title), which went unnoticed when it was released in 2015. This time, the artist saw things in (more) big and surrounded himself with a few famous figures to give us a second effort that moved away from the contemplative style of Anthony Phillips and is dedicated this time to the marine world. To all credit, the beginning of "II" is to the plaintive saxophone of David Jackson (Van der Graaf Generator), evoking a sea air filled with sea spray. This short track introduces a first epic title, "Marine Extravaganza" which, in a spirit of symphonic progressive, unfolds somewhat repetitive tunes while already highlighting Daniele Pomo's excellent drumming. The serious things will really start afterwards, with "Runaway", a very typical Genesis instrumental with an unstoppable groove, seeing also the participation of a certain Trey Gunn with his War Guitar. Developing similar ideas, 'The Schooner' is the highlight of the album: an 11-minute instrumental located at the crossroads of Genesis, Collage and Camel, linking themes with bright melodies and rendered once again with a beautiful bass/drums rhythm section. The last long track, "Time, Life Again", takes up some of the same recipes, this time with a vocal line proposed by Robert Berry in the first part, while Brett Kull (Echolyn) unrolls a beautiful guitar solo, against a back of neo-keyboards and toms rolls, after a first instrumental section with a syncopated rhythm that will delight the most demanding professionals. A little downside, however, with the performance of the same Robert Berry on 'Runaway', whose slightly hoarse tone doesn't match well with the silky atmosphere. But it's only a small snag for a music that manages to combine complexity and variety while remaining very accessible to the listener. 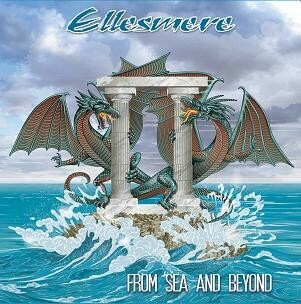 With a beautiful bass and drums duo, worth a targeted listening on its own, Ellesmere delivers an exciting album that will attract many listenings... for the pleasure, quite simply. Ellesmere delivers an exciting album that will attract many listenings... for the pleasure, quite simply.